Just to close this thread, I am letting you know that I fixed it. I used a custom view which extends org.springframework.web.servlet.view.AbstractView. It has a method streamBinaryDataFromArray which transfers a file to the HTTP client, from an array of bytes. So it is working on IE 11/ Edge but not on Firefox. It is a CSV file. It is a bug and I am trying to fix it. However it does not work with Firefox Quantum. Any idea what could be missing ? Congratulations for this second edition of the book. I am curious to know what is new in this second edition. Did you add new chapters and/or added content to existing chapters ? I guess the first edition was a success otherwise this second edition would not have been possible. does your book explain namespaces in XML ? If yes, how long are the explanations ? How deep do you go into the details ? does Spring Boot wraps/hides/encapsulates exceptions one way or another ? I get some strange behaviour when an exception is produced. So the exception says the application is unable to build a Hibernate SessionFactory but it does not point out precisely where the problem comes from. 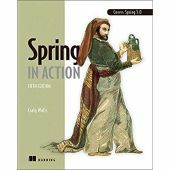 congratulations for another edition of the book "Spring in action". The reason to run the queries in parallel is to make the web application run faster. When the user searches for some data, the result is displayed in a new page. This new page contains the data inside a datagrid (first query) and various sums in the footer (second query). I want to execute 2 JPA queries in parallel. I am wondering if it makes sense. It works for the moment. How to print a datagrid ? has anyone been able to print the content of a datagrid ? I tried the print-it library, with no success. It works for a lot of widgets that are inserted in a div but i could not use it for a datagrid (nor a celltable).